Volume is down. So are reimbursements. Imaging departments—like everyone else—are being asked to do more with less. It makes for some tough times. “I’ve been doing this for 30 years, and this is the most challenging time I’ve ever seen,” says Mark Lerner, RT, director of diagnostic imaging at The George Washington University Hospital in Washington, D.C. 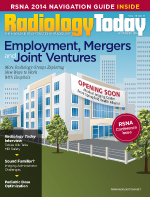 Traditionally, hospitals have relied on their radiology departments to be revenue centers. Income from imaging studies, particularly high-end exams such as CT and MRI, helped offset losses in other areas of the hospital such as the dialysis lab and emergency department, says Jason Scott, MBA, FAHRA, CRA, RT(R )(MR), director of imaging at Witham Memorial Hospital in Lebanon, Indiana. But with volumes decreasing and reimbursements for imaging studies steadily declining, it’s making for precarious finances and tough times, he says. Lerner, Scott, and other radiology department administrators interviewed for this article say rising costs and lower reimbursements are driving several issues they have to deal with daily, including staffing, equipment replacement, patient satisfaction, and radiation dose. Competition is also an issue as insurance companies encourage their patients, if they are able, to have their imaging studies done at outpatient rather than hospital facilities. Outpatient facilities have lower overhead than hospitals and can charge less, Scott says. The competition keeps hospital radiology department administrators on their toes, they all agree. Sheldon-Hannan is concerned about the safety of cross-training. “If you have someone who does a particular study only once in a while, it’s easier for them to miss something,” she says. “CT is so busy; if I had someone who didn’t do it too often, I’d have a problem.” Each modality requires advanced certification, she says, and it’s not easy for people to get the advanced training they need in all the different modalities. The main advantage to technologists who are cross-trained, Reisman notes, is that in this economy and state of health care, they have job security. “We’re faced with decisions like this on a daily basis these days it seems,” Scott says. The Affordable Care Act (ACA) requires employers to provide health insurance to all employees who work more than 30 hours per week. This requirement creates challenges for radiology departments that use contracted staff or when part-time staff pick up additional hours, says Ed Yoder, MBA, MHA, RT(R), CRA, FAHRA, administrative director of medical imaging at Lexington Medical Center in West Columbia, South Carolina. Contract personnel can be laborers, the physicist, the ultrasound company that provides services to the operating rooms, and many others. “If they average 30 hours a week, then as far as the ACA is concerned, you must offer them health care benefits or face serious fines,” he says. It also poses challenges for per required need staff. As director, Yoder says it’s his responsibility to understand staff usage and find solutions to comply with the new labor standard. “Constant changes within the ACA will continue to pose challenges to health care organizations,” he says. As a radiology administrator in this environment, Lerner says it is important that he keeps his staff happy so there is little turnover. His trick, he says, is to leave his desk and talk to his staff whenever he has a few minutes. “I’ve had to increase the amount of meetings I have with my staff,” he says. The face-to-face meetings are meant for him to learn what’s on the staff’s minds and keep the technologists informed of what’s happening in the hospital. Lerner believes treating staff well “goes a long way in keeping them. If they come to work and know they’re going to be treated right and talked to, they do the best they can every day,” he says. How they are treated is even more important than salary, which in this economy and health care environment, is hard to continually raise, Lerner says. He notes that unlike many facilities, The George Washington University Hospital has not seen a decline in its imaging volumes. The economics of health care have made updating and replacing equipment in hospital imaging departments an issue as well, the administrators agree. Radiology equipment is expensive, “yet every time you buy something, it’s already outdated,” Sheldon-Hannan says. As long as the equipment is working, “you do not replace it.” In the old days, she used to buy equipment when she wanted and base her choices on what she liked best, but that’s no longer the case today. Sheldon-Hannan would like to replace some equipment “but there’s no justification for it, and you can’t bring in fancy new equipment if you’re not seeing growth,” she says. Bariatric surgery has become big business at her hospital as it has in many, she says, and it would be nice to have additional imaging equipment that can handle obese patients, but economics prevent it. When she is able to buy new equipment, it’s a lengthy and difficult decision, Sheldon-Hannan says. In the market for a digital portable X-ray machine, she finds the vendors for the manufacturers she’s considered are persistent. “I have different vendors constantly e-mailing me: ‘Are you going to buy mine?’” she says. St. Vincent’s Medical Center is part of Ascension Health, which operates a nationwide network that includes 77 hospitals. As a result, when Sheldon-Hannan does want to buy new equipment she has to go through the system. And the vendors she chooses have to be those with which Ascension has contracts. Scott agrees that replacing high-end imaging equipment in the current environment can be challenging. “You used to replace it every five to seven years,” he says. “Now they’re asking that it last at least 10 years.” As with staffing, hospital administrators are looking hard at purchase requests and asking, “Do you really need this new equipment?” One of the challenges, Scott says, is to be able to offer the latest in imaging equipment to compete with outpatient facilities, but with reimbursements for imaging studies being cut, it’s increasingly hard to do. Patient satisfaction also has become a hot topic among hospital radiology departments. As part of the ACA, since October 2012, Medicare has tied a small percentage of reimbursement to value-based bonuses. The bonuses are based on the hospitals’ clinical performance (70%) and patients’ perception of the quality of the care they received (30%). The Hospital Consumer Assessment of Healthcare Providers and Systems (HCAHPS) survey is used to determine the hospital’s patient satisfaction scores. “Every hospital has been struggling to raise its HCAHPS scores,” Lerner says. Every department in the hospital, including radiology, is under pressure to improve the patient experience. For radiology, it means technologists listening to patients and keeping wait times brief. At his institution, Scott says, “we’ve always focused on making sure patients are more than pleased.” But now that reimbursements are tied to patient satisfaction, it’s become even more essential, he says. “We have to be on high alert when it comes to patient satisfaction because if patients are unhappy they’re not going to return to us,” he says. While many hospitals collected information on patient satisfaction, prior to HCAHPS, a national standard did not exist, Yoder says. The challenge for every department in the hospital, including radiology, “is to do well on these surveys so that their national score is the best it can be,” he says. Yoder says his hospital is fortunate in that it has always done well within its survey tool model. Its vendors have helped it flourish and demonstrate the excellent care it provides its patients. “Informing patients about the survey and educating them to the survey is crucial to scoring as well,” Yoder says. “In imaging, we have found that managing the patient up to the survey helps them rate us honestly. When they understand we strive for the best and that if we fall short we need to know, it allows them to understand and rate the care they received.” Yoder plans to move its survey model to a model that is HCAHPS-based. Dosing is yet another issue facing hospital radiology departments. Thanks to a law passed by Congress in July, CT equipment must have some type of dose-monitoring and dose-limiting software by 2016. “How organizations will handle these new guidelines remains unclear,” Yoder says. Many departments are dealing with outdated CT machines. Yoder fears that vendors may only consider dose-limiting software essential on their premium devices. “Rural or struggling organizations may not have the capital to replace aging CT machines and may face reduction in reimbursement if dose-limiting software is not present on their CT machines by 2016,” he says. Some organizations may have to weigh the penalty against the cost of replacing their machines, he says. His hospital doesn’t yet have a solution to this challenge but is looking at dose monitoring offered within its EHRs. Sheldon-Hannan says hospital radiology departments have to not only monitor their equipment but also inform patients about their exposure from their exams. The onus now is on radiology departments to make sure they are performing the requested exams with the lowest dose possible and informing patients of the amount of radiation they receive from the exams. Some facilities provide their patients with cards that inform them of how much radiation they’ve been exposed to during their visit, Sheldon-Hannan says. “We don’t do that,” she says, but adds that it is a possibility in the future. Reisman says dose reporting, while required in California, is not necessary in Indiana. But his facilities do it for CT and he feels it is imminent for interventional radiology and other studies, including nuclear medicine and X-ray. These current issues combined with health care economics mean that everyone has to work smarter and harder. “We have to run an efficient ship,” Reisman agrees. Scott believes that as radiology administrators, “we’re held to a higher standard than we ever have in the past, thanks to the regulations and the reimbursement and the uncertainty with the Affordable Care Act and how it will all play out.” He says it is a very challenging time for those in his position. “We have to do more with less and that makes for some difficult times,” Scott says.